It was 7 men who flew together as a Crew with RAF Bomber Command. They formed the closest of Bonds, forged through an anvil of freezing temperatures, Deadly Flak and prowling Night-Fighters but, with an average age of only 22, their odds of survival were very slim. By 1943 the life expectancy for Bomber Aircrew was just 5 missions – only 1 in 6 was expected to survive their 1st Tour of 30 Operations. The chances of surviving a 2nd Tour were even slimmer. Of the 125,000 men who flew with Bomber Command during WW2, 55,500 were killed. Whilst the ‘Few’ of Fighter Command had undoubtedly defeated the Luftwaffe during the Battle of Britain, it was the ‘Many’ of Bomber Command who were to play the pivotal role in delivering to the Allies ultimate Victory in Europe. But it came at a terrible cost: on 1 Raid alone – the Nuremberg Raid of 30/31st March 1944 – 543 Aircrew were killed, more than Fighter Command lost during the entire Battle of Britain. Between them, the Pilots of Bomber Command won 23 Victoria Crosses during WW2, and countless others were highly decorated for Courage & Commitment. Belatedly the Nation was eventually to Honour all those who served with Bomber Command. They included some of the RAF’s most inspirational Leaders and the most highly decorated RAF Airmen of WW2. 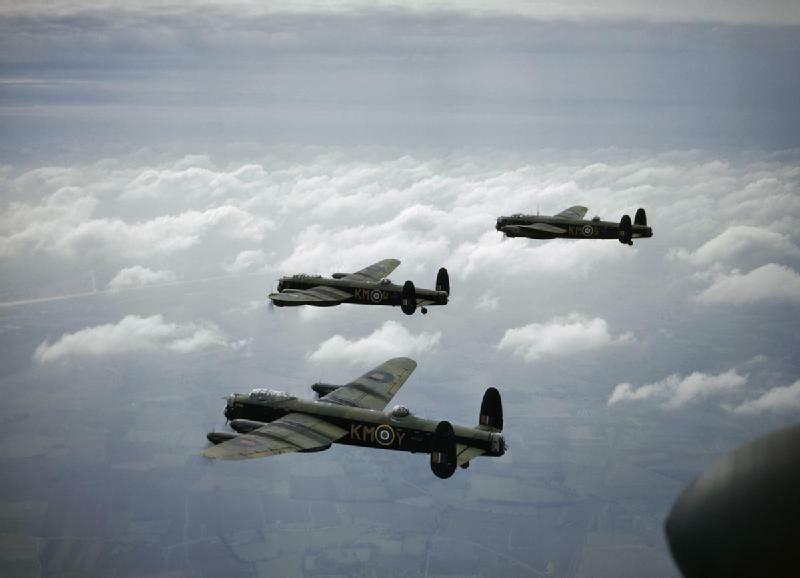 An Operational Tour for a Bomber Command Crew consisted of 30, non-Aborted, Operational Sorties. Upon completion of their Tour, the Crew would normally be rested & transferred to non-Operational Units as Instructors. However, it was not uncommon for a rested Crew member to volunteer for a 2nd Bomber Tour. The exception to the 30 Rule applied to the Crews of Pathfinder Force (No.8 Group) Squadrons. Pathfinder Crew were required to complete 45 Sorties before being rested due to the amount of Training/Practice that was required to become Proficient in Target Marking. Photographs taken from the underside of the Aircraft during the Bombing Run were utilised to confirm that the Crew had completed one of their non-Aborted Operational Sorties. This required the Bomb Aimer to release a “Photoflash” Bomb from the Flare Chute as and when he released the 1st Bomb. The Photoflash exploded in accordance with the timed fuse and, with the Pilot ensuring that he flew Straight & Level for about 30 seconds, the Automatic Camera would take the Picture. The above is an actual Photograph taken by the Automatic Camera on one of the Crew’s Sorties. the Weather conditions and the Crews’ assessment of the Raid. (c) Vehicle Production. Major German Cities were also Targeted. The Missions that scared Navigators, in particular, were those to the Ruhr Industrial Area. This was one of the most heavily defended areas in Germany, known as the Ruhr Valley. Aircrew nicknamed it ‘Happy Valley’. On 5 Operations, one after another other they returned with damage to the Fuselage, mostly holes from shrapnel with some holes very near to where the Navigator was sitting. One piece of shrapnel embedded itself in the ply-wood floor exactly below where he was sitting. It had hit an aluminium strip reinforcing the plywood floor. This bent upwards and splinters from the floor shot up his trouser leg. The Shrapnel had just about lost its momentum; otherwise it would have pierced his backside! The next day a member of the Ground Crew presented him with the offending piece of Shrapnel. The Squadron Commander was always pleased to let Group HQ know he had a number of Aircraft hit by Flak (anti-aircraft fire) – it said “my Boys press on to the Target, despite the Opposition”. The worst operation over Essen was when they were ‘coned’ by all the Searchlights. It was when the Master Searchlight got you that you knew you were in trouble. All the other Searchlights would Point at you, and then every Gun in the area would take Aim. The good side to it was that most of the other Bombers nearby would get a free run and thank you later, if you made it back to Base. The reality was that most people who were ‘coned’ were shot down. On this particular occasion, the Pilot took retaliatory action by throwing the Aircraft all over the sky. We did a severe ‘corkscrew’ to deceive their Radar and continually changed height & direction so that the shells burst where you were a moment before. The Navigator would hear the shells, from his position on the Aircraft, bursting above the noise of the Engines. During close-calls, he could even smell the cordite from the explosions all around him. On reflection, one wonders how an Aircraft could possibly manage to escape such a Barrage when there were probably 15 Guns firing at us. On another occasion, they were all but shot down on our return from Bremen as they crossed the Dutch coast. Just as we were feeling that we were nearly home, a German Fighter shot out of the blue and we were attacked. It was a Junkers 88 with 4 Cannons built into its Nose. Soon, we had a small fire near the Wireless Operator, who managed to put it out. This 1st burst of cannon fire also damaged our hydraulic system, putting the Rear Turret out of action, thus rendering our 4 rear machine guns useless. Furthermore, the Undercarriage had dropped halfway down and the Aircraft control surfaces were damaged. The Wireless Operator sent out an SOS giving their position, as they could have fallen into the North Sea at any time. The Navigator took up a position in the Astro Dome where he could see what was going on. There, he spotted the JU88, which was about to make another Attack. He had to get his Nose onto us and attack us on the beam since all his guns were in the Nose. the Navigator’s strategy was to decide when he was going to open fire and then tell the Pilot to turn into him. He would shout “turn now” at the critical moment and the JU88 would flash past us, but could not get his Sights on us. In total, he made some 4 Attacks and each time we turned into him just as I thought he would open fire. Despite the damaged hydraulic system, they still had 2 machine guns operating in the Front Turret. Just before the JU88 flashed past, our Front Gunner gave it a burst of fire. I could see the tracer bullets accurately in its path. He had to fly into them. I will never know whether the JU88 was hit. Luckily for us, the Pilot saw some low cloud and then flew into it. They were able to lose the JU88 but were now precariously only 100ft above the Sea and unable to climb any higher. As for the Navigator, he was concerned about the Cliffs on the East Anglian Coast, but fortunately, we were heading straight for Norwich on a clear Path. They crossed the English Coast where it was still dark, and where all their own Search Lights would point their light in one direction, thus leading us into the Airfield. We managed to ‘Belly Land’ without Wheels They landed at approximately 110mph, but soon came to a stop with all the Crew braced for disaster. When they had acknowledged their Survival, they were taken to the Mess, given a Double Brandy and discussed how incredibly lucky we were to have made it. During the 30 Operations, they took part in they lost 29 Crews. In other words, the Squadron was completely wiped out, twice. After 8 months we achieved the chilling & dubious distinction of being the 1st crew to finish a Tour of Operations. Upon reflection, they realised just how lucky we were. Though, as in anything else, experience counted to a great degree. They knew Crews who were lost on their 1st, 2nd & 3rd Operations. During the last few months they, therefore, became the “Gen” Crew (the Experienced Crew) and new Crews would approach us for advice, asking how to Survive and what Tactics we used. Soon after we joined we had done the same and spoken to the most Experienced Crew for the same sort of advice. However, after about a further 6 weeks they were shot down after some 23 Operations. 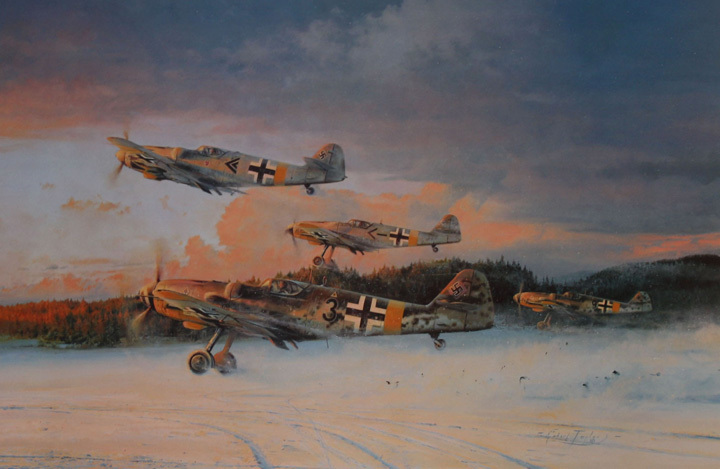 Most demoralising for the less experienced Crews – mind you, they did push their luck – on the way home from Targets they would fly low, probably 1000ft, and sought out German Airfields, Fighter Airfields if possible. They would get onto the Airfield Circuit, machine-gunning anything they could see. They would say “Well, we have to give our Gunners some Practice”. Regretfully, they did it once too often – the Enemy were waiting for them, probably had Fighters Airborne on the Circuit. They were a very good, determined Crew but sadly all were killed. The point which is not often appreciated was the fact that Bomber Command was standing by every day of the War. If the weather was good enough, they would Attack the Enemy. No other force did that. Bomber Command, in total, lost some 55,000 Aircrew. At an Operation on Nuremburg, they lost some 650 men in 1 night. You can contrast this with the fact that during the Battle of Britain, 500 pilots were killed over the whole period of the Battle, comprising the summer months of 1940. I remember those early evenings when we stood and watched while Squadron after Squadron of Bombers filled the skies, to take their part in the Carpet Bombing of Germany. It was the sound of War at its deadliest. The whole Camp stood in silence and watched, and not even one small voice asked “What the Hell are we doing?” We remembered the defenceless City of Warsaw, our Cities like Coventry & Portsmouth. There were many like myself who had endured the relentless Bombing of London during the Blitz, and no one said “Has Bomber Harris gone mad?” With the distance of years; and with hindsight, it is easy to make moral judgements and to campaign to take down the statue of Bomber Harris erected to honour him and Bomber Command. You really need to have stood where we were standing in our time to understand what the reality of our day was really like. My heart will always go out and embrace the men who served in Bomber Command. Ethics are the luxury for those who have come after us. None of their other close friends made it during the War. A few near friends perhaps, but not many. Some were still under Training, flying with us on some Operations. They would have loved to have had these young men as lifelong friends. They were the ‘best’ and were all volunteers. Only volunteers were accepted as Aircrew. It was all such a great waste of life, and all very sad. It becomes even sadder as one got older and could look at things with a more mature and experienced perspective. History certainly tends to repeat itself. They can once again see Politicians as they really are, not acting at the right time until the problem is staring them in the face. In retrospect, they could see that they did not prepare the Forces properly against Hitler and the Nazis, who were obviously preparing for intended aggression long before the outbreak of War.